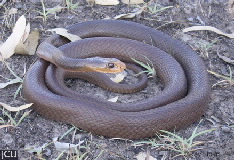 Australia’s deadliest snake, it is found in a wide range of habitats, preys chiefly on small mammals. The body is light to dark brown above, glossy, paler on the sides. Belly is cream to yellow often with orange spots or flecks. Head is large and distinct, paler than the body, particularly on the snout, some flecks may be present. The iris is orange-brown.